Instead of being a mere captain of a few ships, wouldn't you rather take the place of an admiral, commanding during those great fleet battles, those most dramatic of moments when entire empires stood or fell. If so, 'A Sky Full of Ships' just might be the rules for you. Using simple, fast moving game mechanics, ASFoS attempts to portray the important aspects of huge fleet engagements without becoming too bogged down in time consuming detail. A Sky Full of Ships is designed to be an easy, fast moving set of rules for large scifi fleet actions. Everything required for play is included in this single 58 page book - movement and combat rules, a detailed ship construction system, optional rules such as special weapons, fighters, electronic warfare and technological levels, as well as scenarios, sample fleets and more. They also include a short rules summary in a printer friendly format. 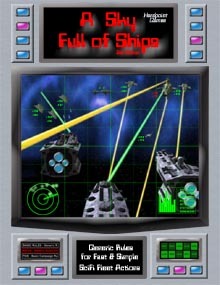 ASFoS is a generic set of rules, there is no specific background or ship designs forced upon the user. The generic nature of the rules will allow you to play in whatever setting you prefer, using any starship miniatures at all from any background. Invent as much or as little of your own universe, or borrow from the sci-fi background of your choice. Playable with as few ships per side as you like, or as many ships as you own, these rules allow large games to be played to a finish, on an average-sized gaming table, within several hours. They're for those players willing to sacrifice some complexity to achieve a fast moving, playable, and most importantly, FUN game.